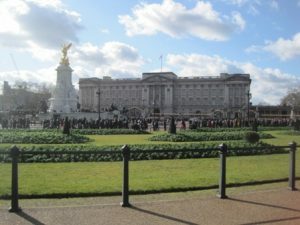 Buckingham Palace is the official residence and administrative headquarters of the British monarch and has been so since the accession to the throne of Queen Victoria in 1837. The palace as it is today comprises more than 600 rooms and has been built around a country house originally designed for the Duke of Buckingham in 1705. Buckingham Palace was bought by George III in 1762 and enlarged in the 19th Century to form four wings around a central quadrangle. The neoclassical frontage of the east wing faces out towards a ceremonial road – the Mall – and supports a balcony on which the Royal Family traditionally congregate to greet the crowds outside the gates. Between the east wing and the gates is the forecourt where the Changing of the Guard takes place. The Royal Standard is flown from the flagpole above the central pediment when the queen is in residence. The Queen holds court in London between April and mid-August and this period is known as ‘the season’. In mid-August the Queen moves to one of her other residences in Windsor, Sandringham and Balmoral, and the State Rooms are opened to the public. The Queens Gallery to the rear of the palace is open all year. The Queen Victoria Memorial stands at end of the Mall in front of the palace and was dedicated to Victoria by her grandson George V in 1911. Queen Victoria is portrayed on the pedestal looking away from the palace north eastwards down the mall. On the other three sides of the monument are bronze statues of the Angels of Charity Truth and Justice. Atop the pillar behind Queen Victoria is a winged figure in gold and he balustrade surrounding the monument is decorated with mermaids and mermen. Every summer the State Rooms are opened to the public. These are the rooms that were designed as public rooms and where the monarch receives and entertains her subjects and dignitaries. The rooms predominately reflect the taste of George IV and include pieces of furniture, chandeliers, candelabra and other works of art intended for his London home when he was Prince of Wales. The tour starts in the guard room and proceeds through 19 rooms including the State Dining Room, the Blue Drawing Room, the White Drawing Room which serves as a royal reception room where the Queen and other members of the royal family gather before official occasions, the Ballroom where state banquets are held (built for Queen Victoria and inaugurated with a special ball to celebrate the end of the Crimean War), the Music Room where the Queen receives guests and the Throne Room where the Queen receives visitors on formal occasions. After taking in the nineteen State Rooms visitors can make purchases at a souvenir shop and walk around the Palace garden and lake. During the Changing of the Guard ceremony, sentries of one regiment of the Guards Division in full dress uniform takes over from another. The New Guard in bright red uniforms and bearskin hats march from Wellington Barracks to Buckingham Palace and, during the course of the ceremony amidst much wheeling and shouting, become The Queen’s Guard. The ceremony is carried out in front of the palace, lasts about 45 minutes and takes place daily at 11:00 from May until the end of July and on alternate days for the rest of the year, weather permitting. The Queen’s Gallery to the rear of the palace was originally a conservatory. It contains paintings drawings and furniture. The collection includes works by Rubens, Rembrandt and Canaletto and watercolours by Queen Victoria. Entry to the gallery is through Buckingham Gate. The State vehicles are housed and maintained south of the palace in the Royal Mews which were built in 1824-5. On display are the richly carved and gilded Gold Carriage made for George III in 1762 and used for coronations, the Irish State Coach bought by Queen Victoria in 1852 used for the State Opening of Parliament, the Glass State Coach bought in 1910 and used to convey visiting ambassadors and dignitaries and the open-top landau used for the weddings of Prince and Princess of Wales in 1981 and Prince William and Catherine Middleton in 2011.